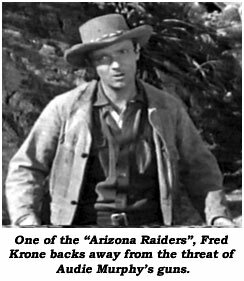 Fred Krone is one of my idols for whom I have the utmost respect. Born in Kentucky June 19, 1930, Fred grew up in California and attended Hollywood High School in the ‘40s. Fred wanted a career as a concert violinist but a 1946 accident where some of his fingers were blown off ended that choice. Since Fred and his sister were connected with a lot of movie people at Hollywood High, they both did a little stunt work in their youth. With his new situation, Fred started doing stunts in earnest in the early ‘50s, doing some doubling for Guy Madison on his “Wild Bill Hickok” TV series. He tried the rodeo business and even did some rodeo photography too. Actress Carolina Cotton introduced Fred to ace stuntman Jock Mahoney who took him under his wing, with Fred soon working stunts and acting on Jocko’s “Range Rider” (‘50-‘53). 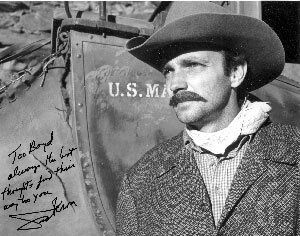 Fred worked for Gene Autry’s Flying A Productions for the next 4 years doing dozens of “Annie Oakleys” and “Buffalo Bill Jrs.” Fred went on to stunt co-ordinate Jock’s next series “Yancy Derringer” (‘58-‘59) and wound up doubling for many of Hollywood’s top stars: David Janssen, Kirby Grant, Myron Healey, James Griffith, Efrem Zimbalist Jr., Gene Barry, Steven Hill on “Mission Impossible” and many others. Fred’s credit list numbers over 850 projects with work on such westerns as “Last of the Pony Riders”, “First Texan”, “Reprisal!”, “Apache Territory”, “Quick Gun”, “Convict Stage”, “Fort Courageous”, “War Party”, “Young Guns of Texas”, Young Fury”, “Life and Times of Judge Roy Bean”, “Undefeated” and non-westerns like “Houston Story”, “Hand of Death” and “Love Bug” as well as TVers “Sky King”, “Johnny Ringo”, “My Little Margie”, “Raw-hide”, “Maverick”, “Wyatt Earp”, “Richard Diamond”, “Laredo”, “Outer Limits”, “Green Hornet”, “FBI”, “High Chaparral” and “Mannix”. In ‘74 Fred voluntarily quit films and began operating a very successful clock repair business until he sold out in ‘92. I was a young kid just out of Camelback High in Phoenix, AZ, when I was hired on “Arizona Raiders” (‘65), an Audie Murphy film locationing at Apacheland Movie Ranch about 40 miles from Phoenix. Fred was on the film and I was mesmerized by this extraordinary athlete. (He’s the one who is cactus-tortured by the Yaquis.) His prowess only solidified my dream of becoming a stuntman. One of the toughest and no-nonsense men I’ve ever been around. The fights he performed hold up today, even 50 years after he did them. They are all out, knockdown, tear-it-up brawls. His nickname “Krunch” came about after a driver on the set saw him work. The name stuck and was even put on the call sheets. Any stuntman at all knows “Krunch” Krone. 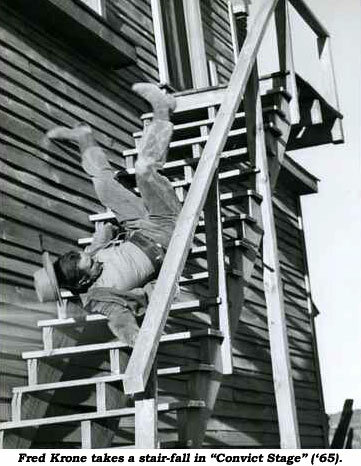 Fred was often hired by stunt coordinators because they knew he’d do the rough stuff without any whining. He just got in there and got the job done in a spectacular fashion. I’ve now been a professional stuntman for 46 years and very few men in our profession have impressed me as has Fred “Krunch” Krone. My thanks goes out to him for paving the way for myself and other stuntmen.